The Gallatin Mountain Range is located between the northern edge of Yellowstone National Park and Bozeman, and flanked by the Gallatin River on the west and the Yellowstone River on the east. Its steep canyons, dense forest, dramatic waterfalls, and rugged 10,000 peaks offer fantastic hiking, camping, fishing, and mountaineering. 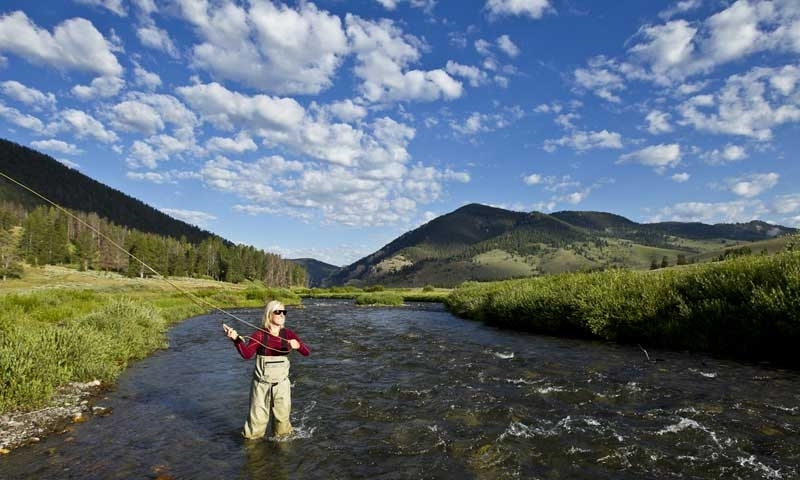 Fish the Gallatin River, one of the premier trout fishing rivers in the U.S.
What can I see and do in the Gallatin Mountains? These towering 10,000-ft peaks parallel the winding, trout-rich Gallatin River and US-191 between Big Sky and Gallatin Gateway. That means super-easy access to world-class fishing and hiking: just choose a highway pullout and step into the river or onto a trail – rainbow trout, 80-ft waterfalls, glacial lakes, and the petrified forest await. Three miles south of Big Sky off of US-191, take the Porcupine Creek trail for an 8-mile trek to the magnificent Gallatin Petrified Forest. These trees were preserved in their upright positions, and after wandering through the 55 million-year-old forest, you can take a small sample for yourself (free permit available at the District Ranger Office). Start at the Buffalo Horn trailhead, 15 miles south of Big Sky off of US-191, for the 37 mile Gallatin Divide Devil’s Backbone Trail. On this multi-day hike you’ll backpack north through Gallatin Petrified Forest, along steep ridges, and to the top of 10,299-ft Hyalite Peak, ending at the Hyalite Creek trailhead. On the eastern side of the range lie the volcanic cliffs of 80-ft Palisade Falls. Most take the paved, half-mile path from the trailhead off of Hyalite Canyon Road, 20 miles South of Bozeman. Over 15 designated campgrounds are open May 15 - September 15. Red Cliff Campground is the closest campground to Big Sky. Fish 700 high mountain lakes and reservoirs year round and 1,740 miles of streams and rivers from the third Saturday in May until the end of November. The Gallatin River, just West of the Gallatin Range and easily accessible from Big Sky, has some of the best trout fishing in the country. Some of the best and most consistent natural ice climbing in North America, Hyalite Canyon has over 140 ice climbing routes over the course of two and half miles. That includes Winter Dance, what some climbers site as one of the top ten sites in the world. Plus, it’s easily accessible - find these concentrated ice climbs right along Hyalite Canyon Road, about 5 miles South of Bozeman. Where is the Gallatin Mountain Range? Located directly east of Big Sky, the Gallatin Range runs north south between Bozeman and Yellowstone National Park. It is bordered by the Gallatin River on the west and the Yellowstone River on the east. It is accessible via trails all along US-191 between Bozeman and 15 miles South of Big Sky. Call the Gallatin National Forest office at (406) 522-2520.